NAPPANEE — Brian Burkholder's customers use solar energy to power everything from electric sports cars to buggy light batteries. Burkholder is president of Solar Energy Systems in Nappanee, which started with off-grid installations and soon expanded into systems that tie into the power grid. An electrician by trade, he was drawn to solar power by curiosity and liked the results enough that he decided to go into business. His nine full-time employees regularly service an area that stretches from Detroit to Indianapolis, though they've also done installations in five countries and 24 other states. Their customers include schools, churches, businesses, farms and homes, he said during an open house for his company Thursday. "Not one of my customers has said they regret switching to solar," he said. Burkholder estimated that about a third of his customers are Amish, like himself, who often use solar power to replace or supplement gas-powered generators. He pointed out 12-volt refrigerators and freezers in his showroom that can run off solar panels, and noted there are washing machines available too. About 200 of his customers in northern Indiana are completely self-sufficient, or nearly so, he said. "It's very, very popular, because we're all about self-sufficiency," Burkholder said. Amish families are the main customers for Wayne Eash, president of Photon Electric of Millersburg. He estimated that commercial customers make up about 10 percent of his businesses and agricultural another 15 to 20 percent, while all the rest are residential. "There are no English people in the area who'll use a generator if a power grid is available," Eash said. "There are English people with agriculture barns, but a generator isn't their prime power source." Wind and solar power adoption are common enough among the Amish that Chris Godlewski, Elkhart County planning and development director, said he sees them included in building plans from the start. "It seems like when they do a barn project, they incorporate it rather than making it an add-on later," he said. Eash said in a cost comparison of fuel to solar over time, the solar option makes perfect sense. He calculated that the initial cost of installing a solar system is made up in fuel savings after three to six years, depending on the price of gasoline. "In the agriculture world, if you have to run a generator 24/7, a solar system is a no-brainer," he remarked. 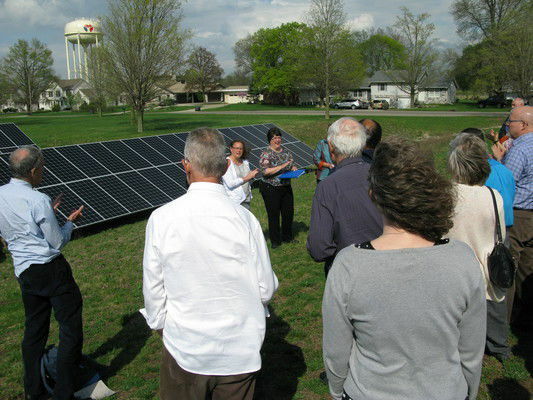 For the Anabaptist Mennonite Biblical Seminary in Elkhart, covering a quarter of their energy needs with an array of solar panels is about more than just saving money. It's part of a larger responsibility of caring for creation by reducing the campus's carbon footprint, Admissions Counselor Janeen Bertsche Johnson said during a dedication ceremony Thursday. Seminary leaders and attendees of the Rooted and Grounded conference under way at the time gathered to extend hands toward the 180 ground-mounted 330-watt panels on the south side of campus. They also received a blessing, which extolled them to be empowered by the sun and the Son, and sang a hymn, "Yonder Come Day." The $121,000 project follows 10 years of green initiatives, from keeping beehives in the courtyard and planting wildflowers to cut down on lawn mowing, to making the library Gold Level LEED-certified with rain gardens, triple pane windows and a closed-loop deep well geothermal heat pump system. The solar array was a Master of Business Administration capstone project by seminary Director of Development Missy Kauffman Schrock. It generated some interest among other members of the interdenominational Seminary Stewardship Alliance, who are all similarly dedicated to creation care, Bertsche Johnson noted. "We care about how Christians think about the world, about how they act toward the world and about our witness. This is a way to say to the community, there are things you can do to be more sustainable," she said. "We believe part of a good theological education includes learning ways to relate to nature -- creation, I suppose we would say."